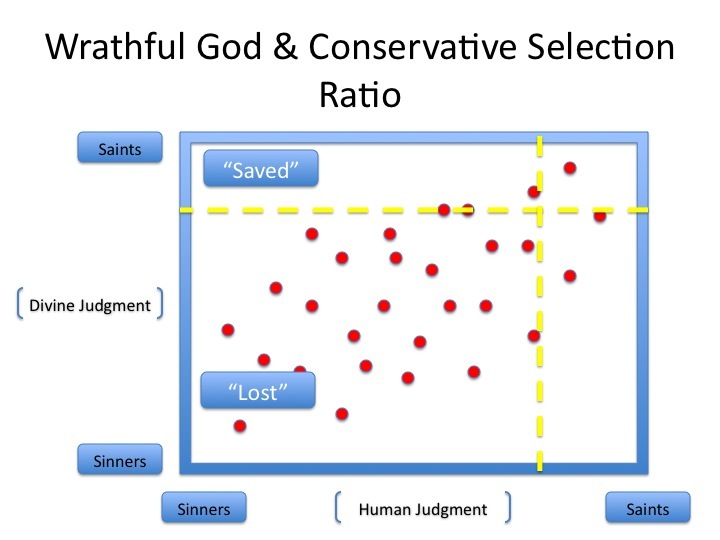 In my post on Type 1 and Type 2 error (which you'll need to read to make sense of this post) I focused mainly upon the selection ratios of conservative and liberal churches. 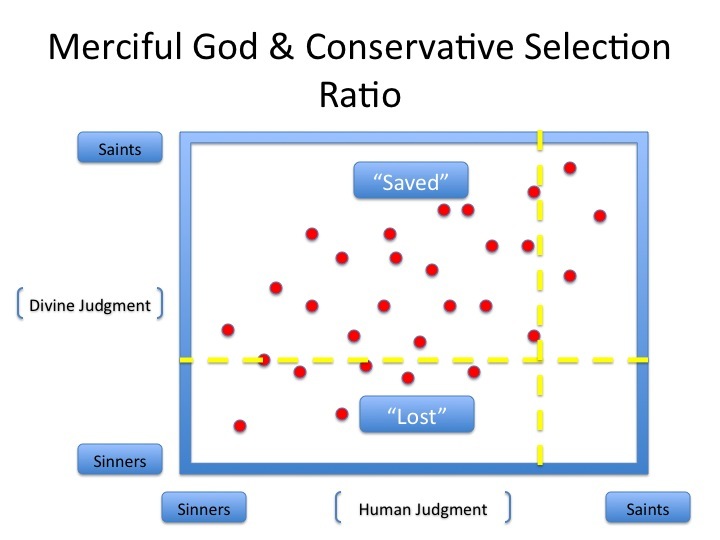 If you recall, I used the idea of a selection ratio to think about the "errors" we can make in our decisions to become more inclusive or exclusive in the Christian church. But it occurred to me after that post that I wasn't addressing what we think might be going on with the Divine base rate, about who God will save or damn. 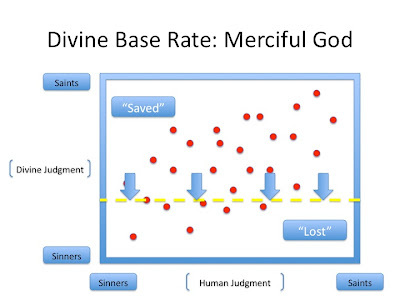 By analyzing the Divine base rate we quickly realize something I mentioned a few weeks ago: A view of God is often rumbling in the background when we talk about moral or doctrinal issues. 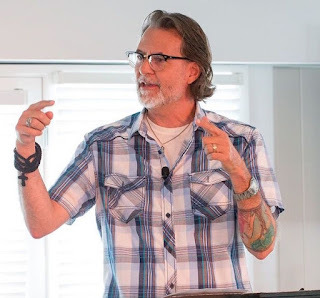 That is, while it seems that we might be disagreeing about this or that bit of biblical interpretation or application, what we are really disagreeing about is what God is like. There is, in a sense, only one real argument Christians have: What is God like? Everything we fight about is really just another version, in different guise, of that same question. What is God like? That is, given that the vast majority of the world population is damned you need to work hard to get yourself into that upper right hand quadrant. Life is like the Titanic: There are very few lifeboats, so you better find one. That is, given that God is basically generous we, too, should be generous. 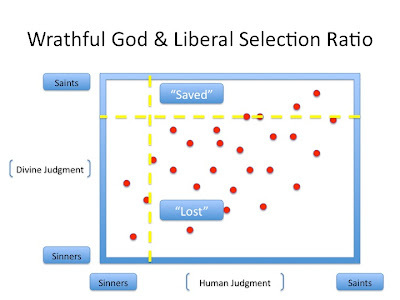 In short, the liberal and conservative selection ratios "make sense" given their background view of God. Okay, in light of this how do the two groups view each other? 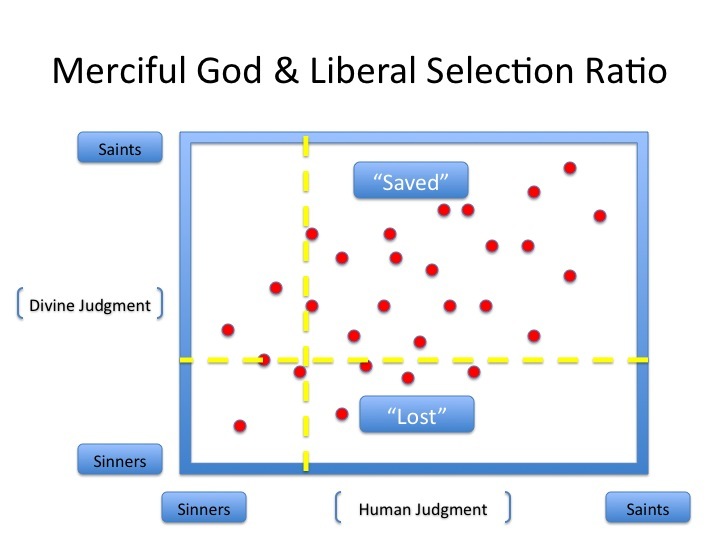 What if you have a liberal selection ratio and God is wrathful? 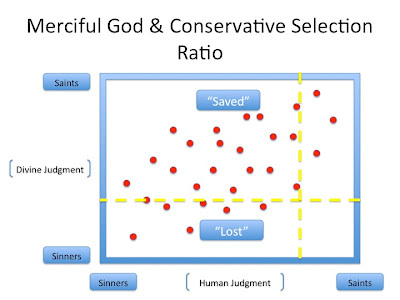 Or if you have a conservative selection ratio and God is merciful? Looking this over you can see the source of the conservative's alarm. For the conservative, given their background assumption of a wrathful base rate, the liberal selection ratio is just playing with fire. Look at all those Type 1 errors (right/bottom quadrant)! All those people who happily think they are going to heaven when they are actually going to be damned. In this we can see the complaints the liberals have about the conservatives. Look at all those Type 2 errors (left/upper quadrant)! Conservatives are walking around damning to hell all these people who, in fact, are objects of God's grace. Such behavior is very unseemly. It's so judgmental. All we are illustrating here is what I said above: Christians have only one debate with each other. What is God like? The conservative objection to the liberal selection ratio is really an objection to their view of God. 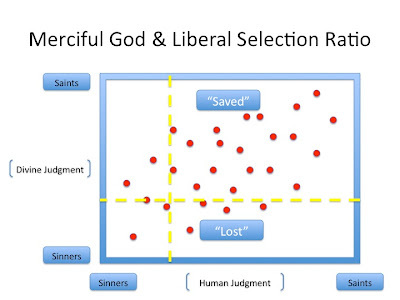 Because if the liberals have God's base rate right then their selection ratio is just fine. Same with the liberal objections about the judgmental nature of the conservative selection ratio. At root, it's really an objection about the conservative view of God. 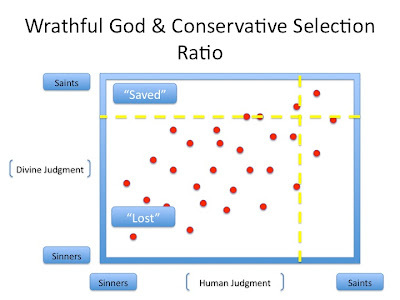 Because if conservatives do have God's base rate right then their selection ratio also makes sense. So, I guess we have to ask the question: Who has God's base rate right? Let me go ahead can give you the correct answer. That'd be worth your time in reading all this, right? For me to give you the answer to the most vexing question in Christianity? Because, to be honest, it is all very confusing. The bible really is a mixed bag on this score. Take Jesus. The same guy who said "Father forgive them" is the same guy who said "Broad is the road that leads to destruction." 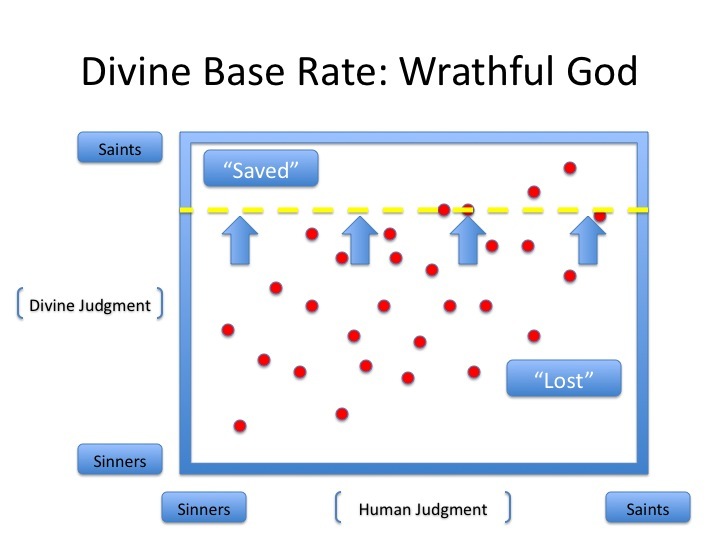 The point being, you can find plenty of Scripture to defend you view of God's base rate. So here is what I think is going to happen. Take it for what it is worth. I think both parties are correct. 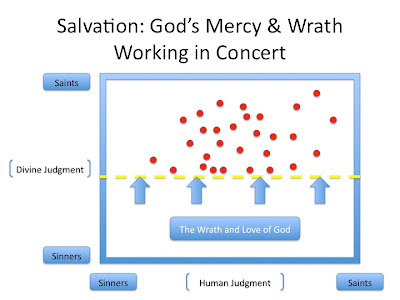 God is both merciful and wrathful. 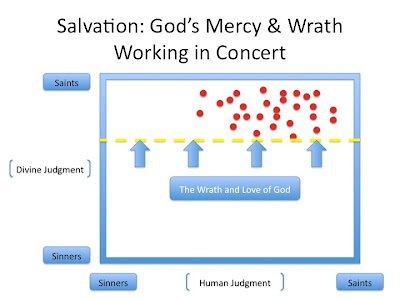 But here is the key point: God's wrath is his mercy and his mercy is his wrath. God is self-consistent. His attributes and desires do not come into conflict. 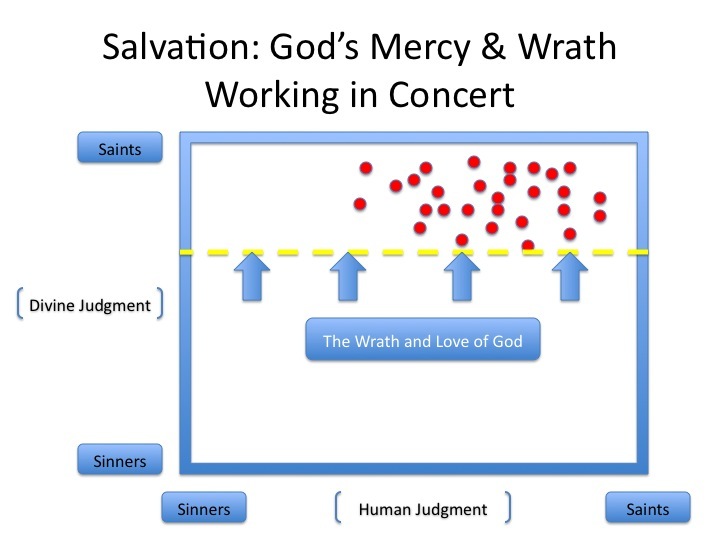 That is the mistake I think the liberals and conservatives are making, they are pitting God's mercy against his wrath. And vice versa. Like it is an either/or. But I think it's a both/and. I think both the liberals and the conservatives have it right. The Divine base rate is low and it is also high. We stand under both the judgment (we are not yet who we should be) and the incomprehensible love of God. And these will work in concert to bring us to salvation. And although that last slide looks a little crowded, I'm simply trying to represent what the Greek Orthodox call theosis, when God will be "all in all." When we all "get to where we are going." 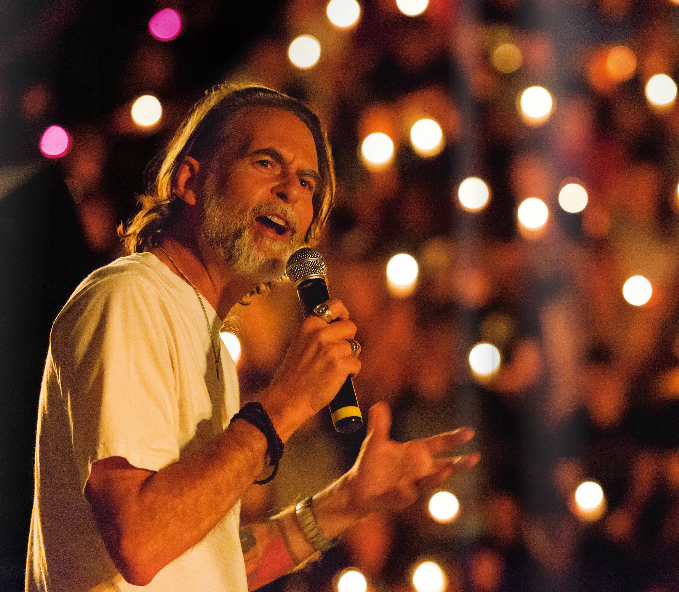 The place where we are finally folded into the life and love of the Father, Son, and Holy Spirit. 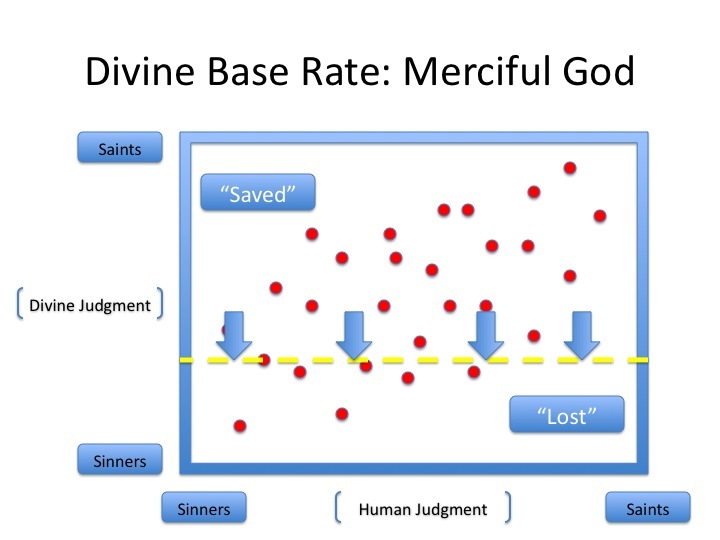 So I think liberals and conservatives are both right about the Divine base rates. They just disagree on timing. Conservatives, you have the early picture. And it's an important picture. Liberals, you have a later vision. And it's good to know where we are headed. The problem with the both pictures is that out of sync neither work. But synchronized, well, synchronized you can see the great drama of God's saving mercy and judgment. Nice pirouette! You should be on "Dancing with the Stars." Judgement on Earth is to push us toward repentance. 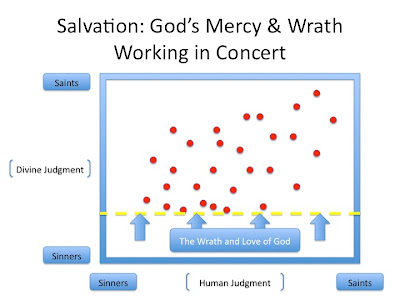 I once read about what was called a "severe mercy." Allowing sin to occur and expose the sinner to bring about repentance. 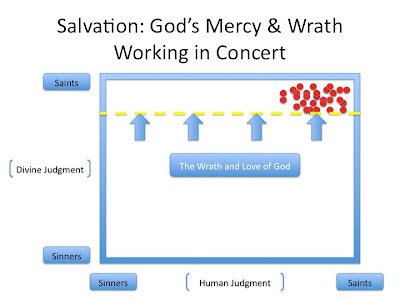 I believe I've been a recipient of "severe mercy" a time or two. It's the premise (albeit now totally perverted) of our legal system. The name "corrections" sums up the intent. "Severe mercy" only makes sense if we believe in the Sovereignty of God that works through, in spite of, with, and/or against the will of man. I wonder if present-day Christianity begins with the premise that God desires all to be saved? But now we're back to how we view God. Good post. i was thinking about you and your blog yesterday and wanted to ask you a question. Perhaps you've already addressed this elsewhere on your blog and i'm simply not aware of it. But it seems there is a great deal said about people needing to forgive themselves and not beat themselves up over things in our day and time. And i don't see a lot of this sort of self-relation mentioned in scripture. Do you think i'm simply missing obvious passages that do include this? Do you think this is a psychological emphasis in our culture not shared in biblical cultures? How do we make sense of this? Arguments about God become absurd, as they are based on speculative arguments. And some psychologists believe it has more to do with brain functioning, whether one tends toward a liberal or conservative view. And these views, the conservative and liberal, shouldn't have anything to do with God, but what kind of society we desire to live in. We will disagree depending on how we play out on the social and fiscal ways of understanding the political. When one talks about "God", it only makes the stakes higher, and the dialogue more defensive/oppositional as the conversation becomes about salvation, eternity, "God's will", ETC. ETC. Let's leave the political discourse on the real and practical level. Where are we to act? I would argue that the Church is to help transform us more fully into God's obedient children. Especially for us non-universalists, we raise the base rate because we are trying to encourage Christian formation. 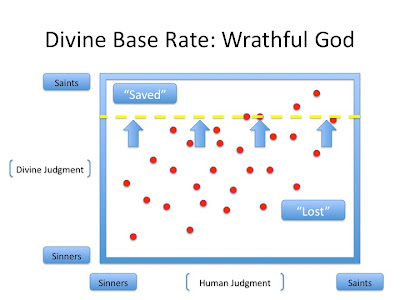 God forgives (low base rate), but we should not keep sinning (high base rate). And this is where the whole "base rate" and "selection ratio" metaphor breaks down. It's all predicated on an other-worldly status and destination. So if we put all this aside, I think people of all soteriological stripes can agree that making disciples is what the Great Commission is about. Hey Angie, where you been? Welcome back. Ooh, now those graphs I really like. You know, at some point yesterday I found myself thinking back to your first post on this topic, and I realized that to me, the "Type 1" and "Type 2" errors seem backwards. The metaphor that made sense to me as an undergraduate statistics student was of the American judicial system: A Type 1 error was convicting an innocent person, while a Type 2 error was letting a guilty defendant go free. Of course, this works nicely because our judicial system is founded upon the principle of "innocent until proven guilty," just as in must experimental studies we should accept the null hypothesis as "true until proven false." Anyway, your analysis essentially switches these errors so that we are "damned until proven saved"; and I suppose this is with good reason, since that is the underlying assumption of traditional Christian soteriology. But it occurs to me that another way to approach the liberal/conservative split is to simply switch the two types of errors. Regardless, thanks for another though-provoking post. The microcosm of my career (software engineering) as it plays out in the macrocosm of my life. Figuring out how to balance orthodoxy and orthopraxy in my life (as it seems there are people that will fight to one extreme or another). 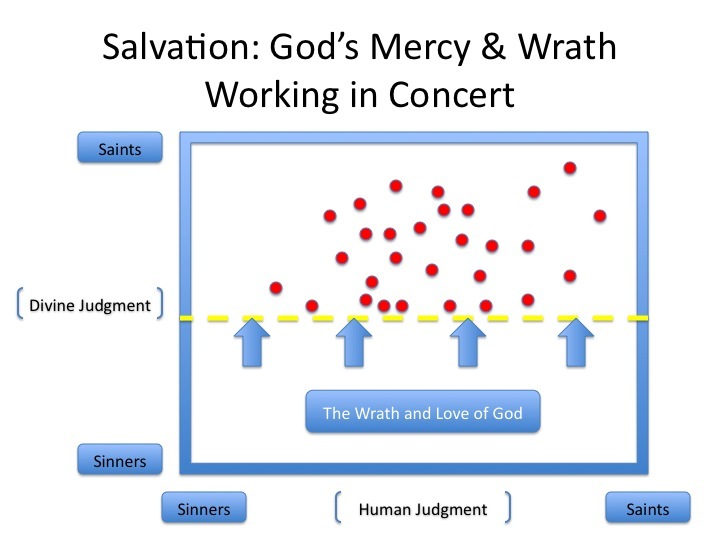 Figuring out the living under the justice and the mercy of God. It goes on and on. I wasn't expecting to find the Type1 vs. Type2 errors to reveal this until now. Amazing stuff. Now my problem is seeing how the trinity fits into the "dualism". 8^D Keep up the great work! Yes, that final move is MacDonald through and through. He's the best. Well said qb - Richard has redeemed binary thinking! These graphs are delightful. I think you've created a fabulous framework for exploring with these to blog posts!!! Fun. Richard, thanks for doing this. And for your good humor in it. 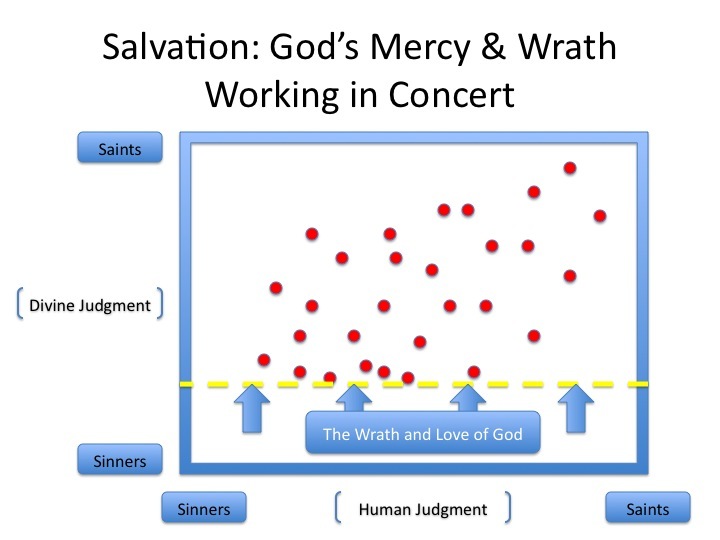 In systems terms, God is the identified patient (suffering and expressing our human dysfunctions) using a genetic algorithm tied dynamically a central limit theorem for deciding God’s own base rate for who goes or doesn’t go either way into the great topological sheave. It rather scares me and simultaneously pleases me to no end (sufficiently? insufficiently?) that God might use random arrows (1 Kin 22:34ff) as a sort of divine double blind to purify God’s own genetic learning curve as God makes up God’s yet-un-made-up mind about the genetics of the evolving base rate for who should and shouldn’t go hither or yon. Hey! If I’m going to spin an oxymoron, why not a solid one? Though process thinkers would game to take this ramble seriously. I know I can beat ‘em. I’ll get the last move! What Beautiful Mind. There is a group here in Abilene called "God and Guinness" that talks theology over pints. I've read this a few times and (in the nicest possible way) it's really obvious, but somehow not obvious until it's pointed out this clearly. So thank you for that. One thing that I can't get away from though, is how this obsession with knowing who is and isn't saved can be a sensible basis for church. Let's face it, you will get it wrong at some point, probably quite often, so why worry so much? Equally I can see that there might not be a lot of point to a church which no direction, definition, challenge or criteria for faith - but the middle ground of "trajectory" - that is, a place where people are healed, discipled, and able to grow, regardless of your or my personal judgement of their salvation; well, that seems to make sense. Nice post. I love the 'solution' you found that moves from a static picture to a dynamic one. I would say that this is not only an Orthodox reading (theosis) but also, this constant movement and struggle to move from sinner to saint, could be considered a Catholic reading. Thank you for teaching me about the Greek Orthodox notion of theosis. According to the Universalist Church in the very long run God will not punish us eternally. The Unitarian-Universalist theological notion is close to what you seem to be saying.